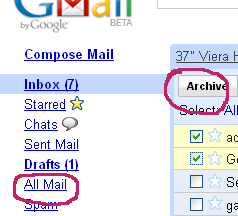 With Gmail archive, you can simply move your email from Inbox view to All Mail. Any message you have archived can be found in All Mail, with this feature you don’t have to delete mails which you may want for future reference. 1. Select the message you want to archive by checking the checkbox. 3. Archived email’s can be found in All Mail.